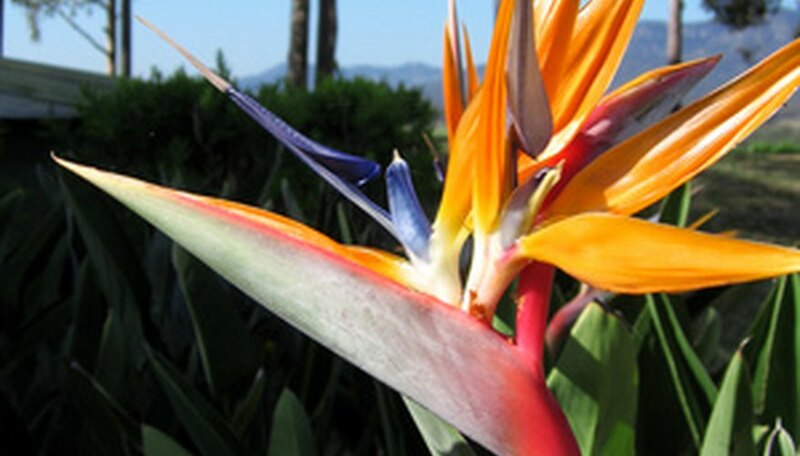 Bird of paradise plants are related to bananas and the exotically flowered heliconia. You can grow them as far north as USDA climate zone 8, where winter temperatures sometimes dip to freezing (32 degrees Fahrenheit). Like their cousin the banana, birds of paradise form large clumps of plants at their base. Although birds of paradise bloom best when they are crowded or root bound, you might want to separate the suckers to keep their growing environment tidy or to start new plants in another part of your yard. They would also make nice gifts for your plant-loving friends and family. Divide mature plants when they are at least 3 years old. If your bird of paradise is in a container and its roots are growing through the drainage hole or the plant is breaking its pot, this is your cue that the plant wants you to separate it into several pieces. If your plants are in the garden, but have escaped from their defined area, this is the time to separate the suckers and start more plants. Dig around the base of a clump planted in the ground with a sharp garden spade. Insert your spade in a circle around the clump and then dig down as deeply as needed to release the entire clump from the soil. Separate the individual plants from the clump by cutting them with an old kitchen knife or chopping them with your sharp spade. Take root-bound birds of paradise out of containers by running an old kitchen knife around the inside of the pot. When the clump of plants is free, remove it and separate the individual plants by cutting them apart with your knife. Sever suckers from the outside of a clump of birds of paradise by cutting them off the clump with your sharp spade while the clump is in the ground. This method works just as well as digging up the entire clump and saves time and effort if you don’t want to completely remove your plants from the ground. Try to get as many roots as possible on the suckers that you separate using this method. Re-pot or replant the separated suckers, keeping them in a sunny area and planting them at a similar depth as the plant you took them from. Leave about 3 feet between suckers if you are planting them in the ground. For container-grown birds of paradise, plant two or three suckers several inches apart in a pot that is at least 12 inches in diameter. You might need to wait up to three years for your newly planted bird of paradise suckers to bloom. How Do I Divide Yucca Plants?